The air shipment is a package of select personal items that we were able to have shipped to us by air (you probably figured that out) rather than putting onto the slow boat. The thinking is that the items in the air shipment arrive much faster than anything on the slow boat (which takes seven weeks - it's really slow) and you don't have to carry everything in luggage on the plane. We were allowed to air ship up to 400 pounds of stuff. Luckily we did not! Right now we are living in a small studio apartment at the guest lodge. We already have filled our closets with clothes and hidden the smaller empty suitcases under our bed. The large empty suitcases are just propped up along the wall. The air shipment is four big boxes which are now stacked up in the kitchen area. Our belongings were packed up on January 28th, the day we moved out of our house. I really can't remember exactly what we put into the air shipment. The only things I know that are in there that I have been missing are some extra contact lenses, a yoga mat and our running watches. I could check my nifty inventory list and see what else we put in the shipment, but instead I decided to open the boxes and see. It turns out that yes, I did put a yoga mat in the air shipment. 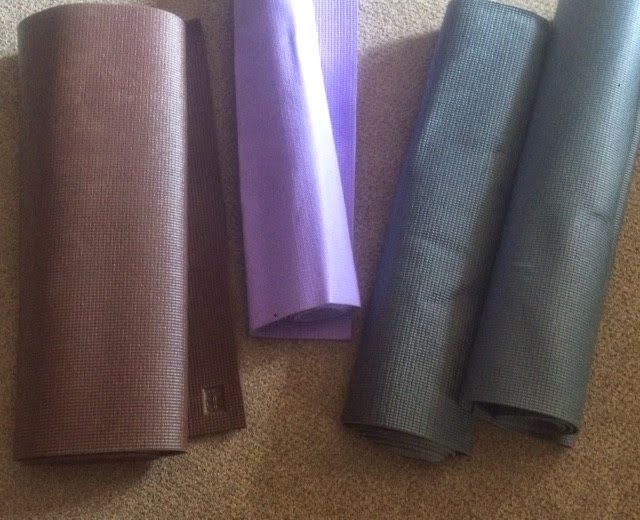 I was apparently under the impression that I'd be starting a yoga school within two weeks or arriving here because I put four yoga mats in the air shipment. Hmmm! It also seems that we put the entire contents of a Walgreen's Drug store into the air shipment. I guess we can store the extra supplies next to our Q-tip stockpile in the bathroom. There were some useful items in the air shipment. Extra shirts that Mr. Deep can wear to work, a flashlight with batteries in case the power goes out which can happen a lot around here, some East Armageddon hot sauce that we like. You know, important stuff! that you want to receive the emails.